Fall in Michigan is a special time of year. Color tours, cool days and crisp nights. to the next level, there’s nothing like a ferry ride to Mackinac Island to remind yourself of everything to love about this special season. It’s easy to imagine the island shuttering up at the end of summer, as the kids head back to school with sharpened pencils and fresh spiral notebooks. 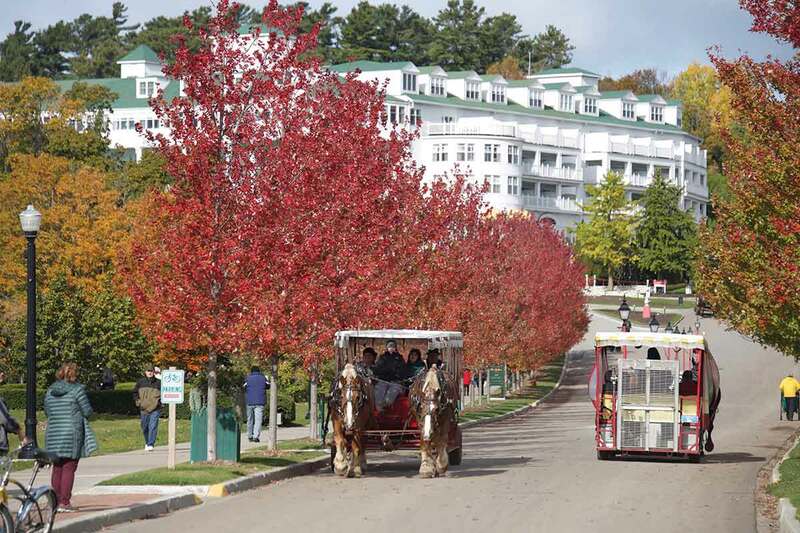 However, Mackinac Island has a rich second life in fall with the gorgeous burst of turning leaves, tempting lodging specials, annual events and shopping sales that are hard to resist. Colorful Maple trees lining Mackinac Island’s Grand Boulevard. the Mackinac Island Convention and Visitors Bureau. the “Mighty Mac” Bridge and eventually the island itself. Disembark from the boat and take a step back in time. Horse-drawn carriages and bicycles meander down streets as you begin to forget you ever owned a car. There’s still a happy buzz of residents and visitors in the fall, but the crowds from the summer months have dissipated—allowing visitors to relax in a quieter atmosphere. 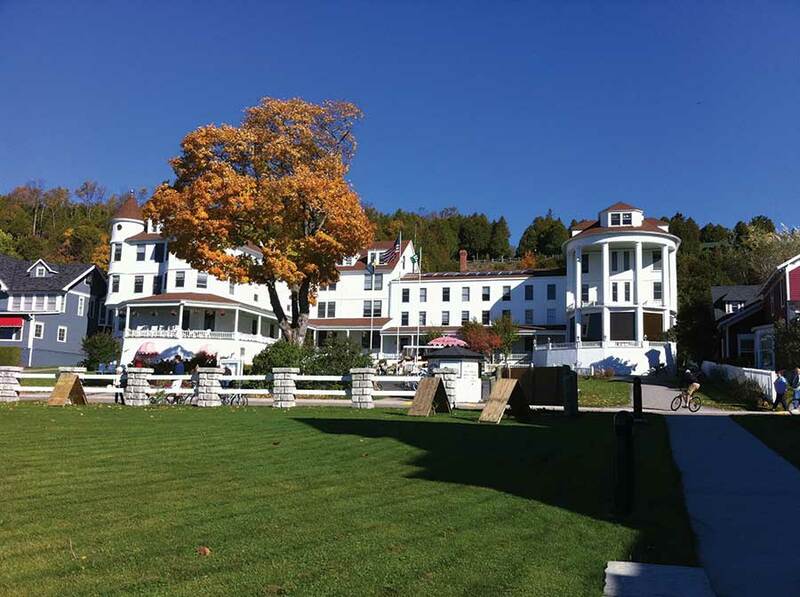 The Island House Hotel surrounded by fall colors. 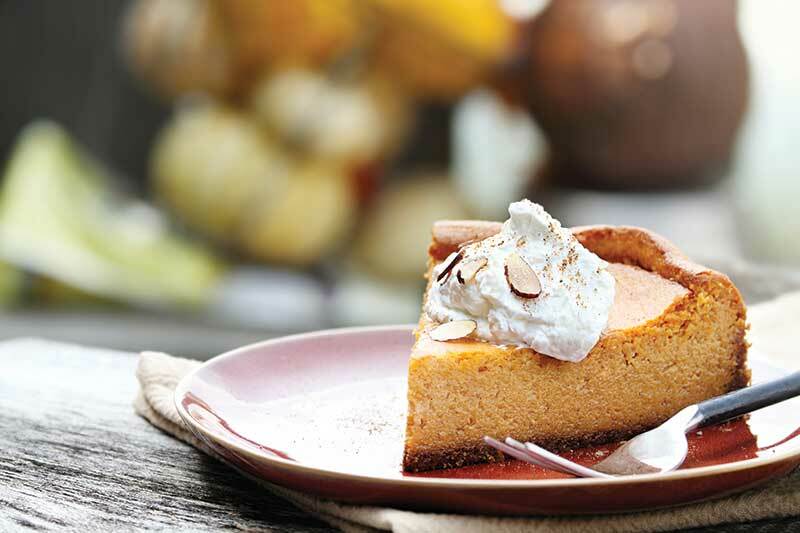 This mouthwatering Pumpkin Cheesecake recipe from Mackinac Island’s own Island House Executive Chef, Phil Kromer, will have you dreaming at night of leaves crunching under boots and the smell of bonfires in the air. Stores and restaurants are still open, with nightly entertainment still scheduled through the end of October at local haunts. Tours are also still booking—whether you’re looking to explore local lighthouses or take a sunset cruise around the island. If you’re hoping to spend your time communing with nature, there are always bicycle and horse rentals. Or you can lace up your favorite hiking boots and explore more than 140 miles of hiking trails on the island. “Each October, we close the season out with our Halloween celebration,” said Hygh. A variety of Halloween costumes make for entertaining people watching. On Mackinac Island, Halloween always falls on the last Saturday in October. Festivities kick off with the annual Great Turtle Trail Run on Saturday morning. 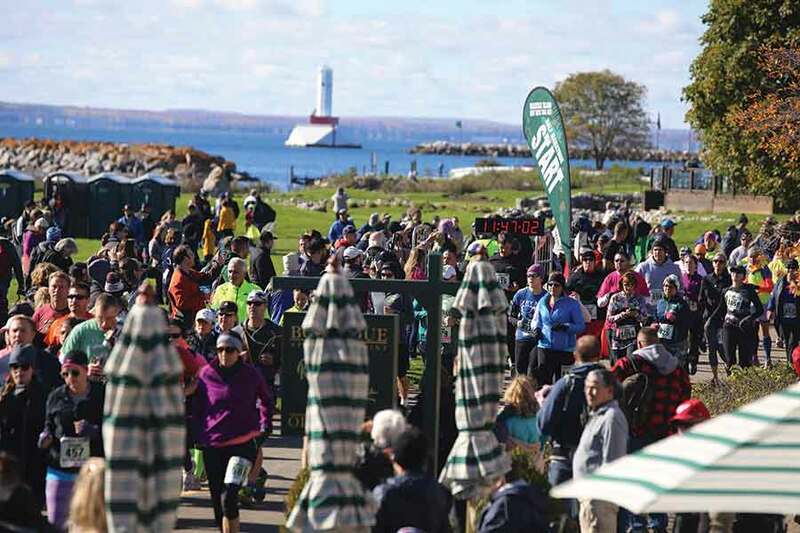 Cooler temperatures and colorful views keep the 2,500-3,000 walkers and runners coming back year after year. Runners are gathered at Mission Point for the Great Turtle Run and Walk. 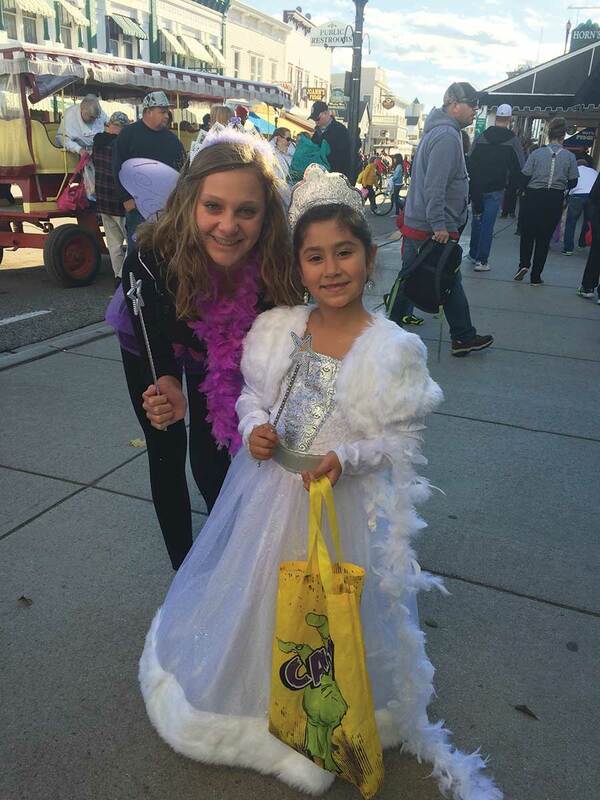 From 3 to 5 p.m. Main Street and side street shops open their doors to trick-or-treaters for a parade of costumes and the inevitable sugar rush that follows. In the evening, adults take their costumes out for a second spin of bustling nightlife at local pubs and restaurants. 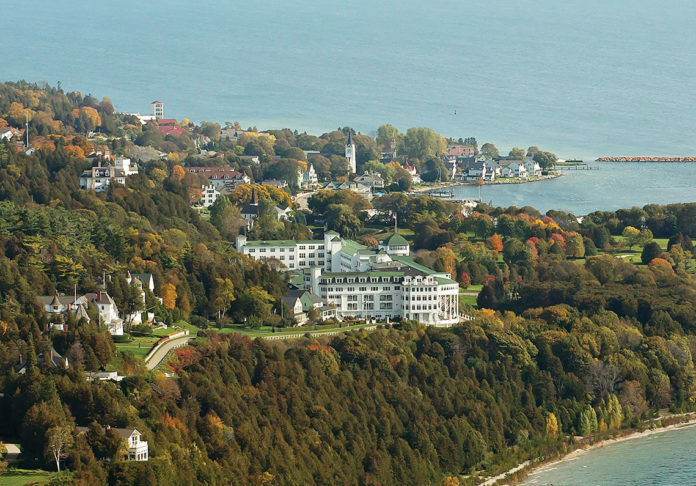 By the end of the weekend, visitors agree that a visit to Mackinac Island in October guarantees far more treats than tricks.